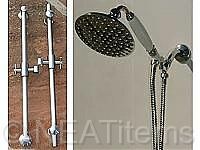 The 5" Euro is one of our most elegant hand shower sets! Vintage, refined and just plain beautiful. 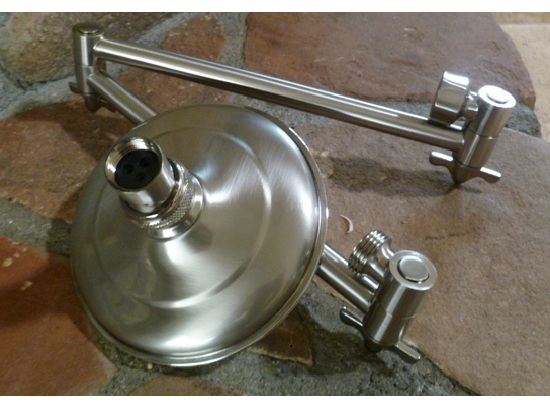 The shower head measures 5.25 inches and on a beautiful brass handle. The handle angle is easily adjusted up and down on the slide rail bracket plus the 5" Euro RainShower Head is on a swivel ball joint for even more adjustment. Comes with a 200cm vinyl hose in white, white & gold, a 150cm brass hose in gold or a 200cm stainless steel hose. You'll love the elegant, yet simple design of these brass slide rails. Choose the style you like best. (in the left picture, you can see the two different styles) These slide rails are very high quality.